In the Amazon port city of Belem, Brazil, David Larsen came to understand the luxury of a few pennies. And the simplest of measures—such as an ordinary antibiotic worth a few cents—could have a profound impact. Larsen now pursues research in infectious diseases and is currently a co-investigator on a malaria elimination study in Zambia. He cannot contain his frustration when he speaks about the children. “Malaria is such a fascinating disease because it’s completely preventable and completely treatable, and it’s been that way for many years, but it’s still one of the leading killers of people around the world,” Larsen says. Malaria, which is marked by high fever, headache and vomiting, also causes anemia, which can be especially devastating for children. There is no vaccine for malaria, so the remedy is to stop or kill mosquitoes or keep them from biting. “Then also it’s about clearing infections quickly with a standard treatment, but one of the problems is that not all infections are linked to symptoms,” Larsen explains. If an infected asymptomatic individual does not seek treatment, a mosquito may then bite that individual and reinfect another individual. “You can carry the parasite with you without being sick but still be a source of infection for others,” he says. 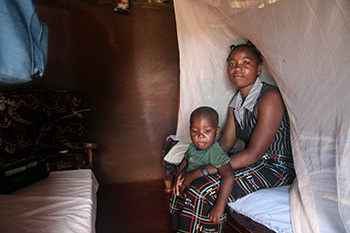 Larsen, who has traveled to Africa many times, submitted the proposal to the Malaria Control and Evaluation Partnership in Africa (MACEPA), a program of the nonprofit health organization PATH and whose funding comes primarily from the Gates Foundation, in Zambia to do a small study. It turned into a multi-year study where they progressively scaled the group to include 100,000 individuals in 40,000 households in southern Zambia, along the shores of Lake Kariba. 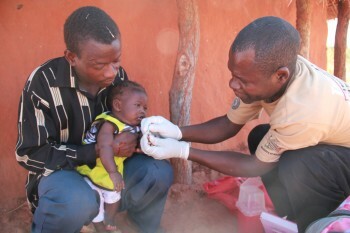 Individuals were screened for the infection and treated; this was done three times during the dry season. 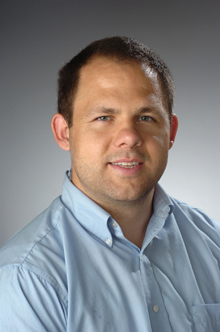 Larsen’s Ph.D. dissertation revolved around the study’s preliminary data. “We found that one round of screening and treatment didn’t affect the parasitic prevalence, but three rounds did,” he says. His current research includes looking at other vector control measures that could complement bed nets. He is also doing research in the areas of Dengue fever and diarrheal diseases, evaluating a sanitation campaign for nonprofit group Akros and UNICEF. Larsen, who teaches “Implementation and Evaluation” this semester and will teach “Epidemiology” in the spring, says his students would probably say he talks way too much about malaria, but he hopes to bring them even greater meaning beyond the facts and numbers.